491. What will be the percentage of total number of males in U.P., M.P. 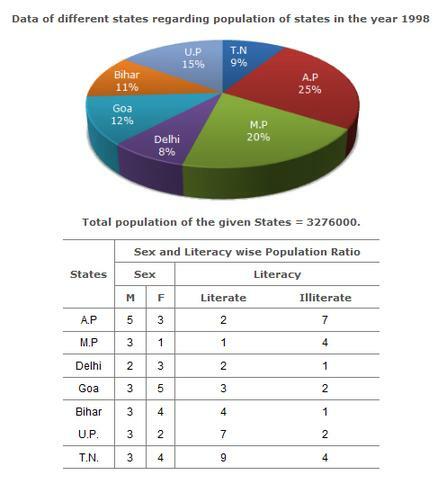 and Goa together to the total population of all the given states? 492. What was the total number of illiterate people in A.P. and M.P. in 1998? 493. What is the ratio of the number of females in T.N. to the number of females in Delhi? 494. What was the number of males in U.P. in the year 1998? 495. If in the year 1998, there was an increase of 10% in the population of U.P. and 12% in the population of M.P. compared to the previous year, then what was the ratio of populations of U.P. and M.P. in 1997?